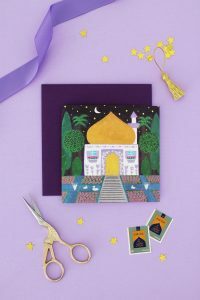 Pretty Pipe Cleaner Ramadan Lanterns – Hello Holy Days! 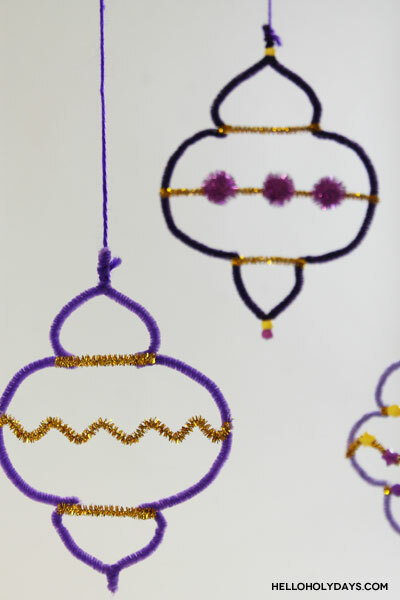 These pretty pipe cleaner Ramadan lanterns are a great craft for children ages 8+. All you really have to do is shape the pipe cleaners to look like a lantern then add on some decorative details! 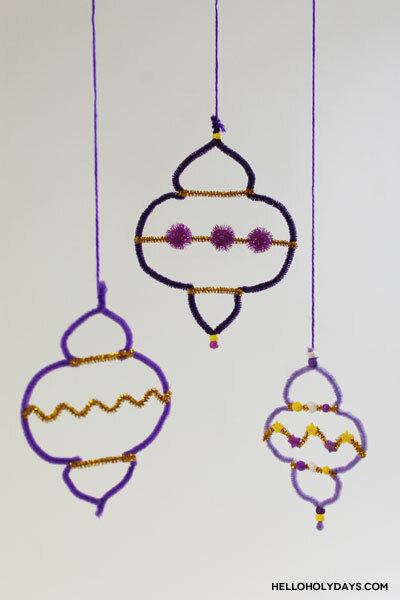 I’ve used simple, everyday craft supplies like pom poms and beads to add decorative details so this is also a great Ramadan craft for classrooms. To adapt this craft for smaller children ages 3 – 5, shape the lanterns in advance and have them just decorate. 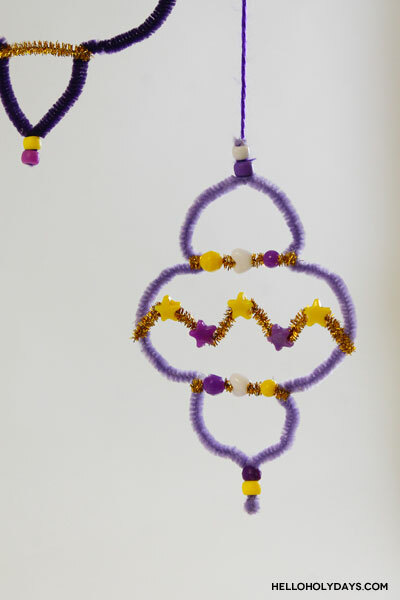 With their festive, purple and gold colour scheme, these pipe cleaner Ramadan lanterns look great once hung up! Take two purple pipe cleaners and twist them together from the top and the bottom. To make difference sized lanterns, cut pipe cleaners to a shorter length and then twist together. Shape the pipe cleaners into a lantern shape as shown in the video. Decorate the lanterns any way you wish. Here, I’ve cut up some gold tinsel pipe cleaners to decorate the lanterns with. You can hot glue the gold pipe cleaners straight on to the lantern of you can zig zag the gold pipe cleaner and then glue. You can also put beads on the gold pipe cleaner or glue on some pom poms. The options are endless!